Brandenburg is one of the sixteen federal-states of Germany. It lies in the east of the country and is one of the new federal states that were re-created in 1990 upon the reunification of the former West Germany and East Germany. The capital is Potsdam. Brandenburg surrounds but does not include the national capital and city-state of Berlin. In 1952, the East German government divided Brandenburg among several Bezirke or districts. Most of Brandenburg lay within the Potsdam, Frankfurt (Oder), or Cottbus districts, but parts of the former province passed to the Schwerin, Neubrandenburg and Magdeburg districts (town Havelberg). East Germany relied heavily on lignite (the lowest grade of coal) as an energy source, and lignite strip mines marred areas of southeastern Brandenburg. The industrial towns surrounding Berlin were important to the East German economy, while rural Brandenburg remained mainly agricultural. The present State of Brandenburg was re-established on 14 October 1990.The newly elected Landtag of Brandenburg first met on 26 October 1990. As in other former parts of East Germany, the lack of modern infrastructure and exposure to West Germany's competitive market economy brought widespread joblessness and economic difficulty. In the recent years, however, Brandenburg's infrastructure has been modernized and joblessness has slowly declined. In 1995, the governments of Berlin and Brandenburg proposed to merge the states in order to form a new state with the name of "Berlin-Brandenburg". The merger was rejected in a plebiscite in 1996 - while West Berliners voted for a merger, East Berliners and Brandenburgers voted against it. Potsdam is the capital city of the German federal state of Brandenburg and is part of the Metropolitan area of Berlin/Brandenburg. It is situated on the River Havel, 24 km (15 miles) southwest of Berlin city center. Potsdam has several claims to national and international notability. In Germany, it had the status Windsor has in England. It was the residence of the Prussian kings until 1918. Around the city there are a series of interconnected lakes and unique cultural landmarks, in particular the parks and palaces of Sanssouci, the largest World Heritage Site in Germany. The Potsdam Conference, the major post-World War II conference between the victorious Allies, was held at another palace in the area, the Cecilienhof. Babelsberg, in the south-eastern part of Potsdam, was a major movie production studio before the war and has enjoyed increased success as a major center of European film production since the fall of the Berlin Wall. The Filmstudio Babelsberg is historically significant as the oldest large-scale film studio in the world. Potsdam developed into a centre of science in Germany from the 19th century. Today, there are three public colleges and more than 30 research institutes in the city. 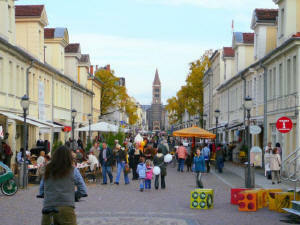 Cottbus is a city in Brandenburg, Germany, situated around 125 km southeast of Berlin on the River Spree. As of 31 December 2005, its population was 101,785. The settlement was established in the 10th century, when Sorbs erected a castle on a sandy island in the River Spree. The first recorded mention of the town's name was in 1156. In the 13th century German settlers came to the town and thereafter lived side-by-side with the Sorbs. In medieval times Cottbus was known for wool, and the town's drapery was exported all over the Brandenburg, Bohemia and Saxony. 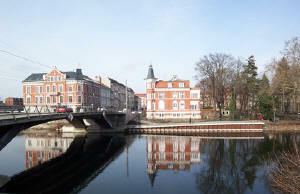 In 1462 Cottbus was acquired by the Margraviate of Brandenburg; in 1701 the city became part of the Kingdom of Prussia. In 1815 the surrounding districts of Upper and Lower Lusatia were ceded by the Kingdom of Saxony to Prussia. From 1949 until German reunification in 1990, Cottbus was part of the German Democratic Republic. 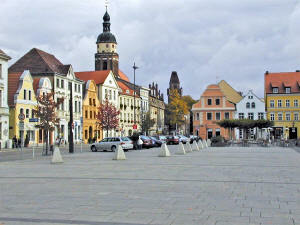 Cottbus is the cultural centre of the Lower Sorbian minority. Many signs in the town are bilingual, and there is a Lower Sorbian-medium Gymnasium, but Sorbian is rarely spoken on the streets. Brandenburg an der Havel is a town in the state of Brandenburg, Germany. It is located on the banks of the Havel river. Population: 74,129 (December 31, 2005). 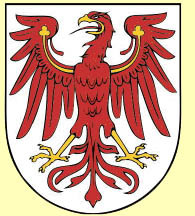 The town of Brandenburg, which is almost as widely known as the state of Brandenburg, provided the name for the medieval Bishopric of Brandenburg, the Margraviate of Brandenburg, and the current state of Brandenburg. Today it is a small town compared to nearby Berlin, but it was the original nucleus of the former realms of Brandenburg and Prussia. A concentration camp, one of the first in Germany, was located on Nikolaiplatz in Brandenburg Old Town. After closing this inner city concentration camp, the Nazis used the Brandenburg-Görden Prison, located in Görden, a suburb of Brandenburg. In the Nikolaiplatz camp, the Nazis killed people with mental diseases, including children. They called this operation "Action T4" because of the Berlin address, Tiergartenstraße 4, the headquarters of this planned and well-organized killing "euthanasia" organisation. Brandenburg an der Havel was one of the very first locations in the Third Reich where the Nazis experimented with killing their victims by gas. Here, they prepared the mass killings in Auschwitz and other extermination camps. After complaints by local inhabitants about the smoke, the mobile furnaces used to burn the corpses ceased operation. Shortly after this, the Nazis closed the old prison. After the unification the city's population declined from over 100,000 in 1989 to roughly 75,000 in 2005 through emigration. The migration was mainly by young people. As a result, the future of the city is uncertain. The Spreewald (German for "Spree forest"; in Lower Sorbian: Błota) is situated 100 km south-east of Berlin and designated a biosphere reserve by UNESCO in 1991. It is known for its traditional irrigation system which consists of more than 200 small channels (called "Fließe"; total length : 1,300 km ) within the 484 km² area. The landscape was shaped during the ice-age. Alder forests on wetlands and pine forests on sandy dry areas are characteristic for the region, however, also grasslands and fields can be found. As of 1998 about 50,000 people live in the biosphere reserve. 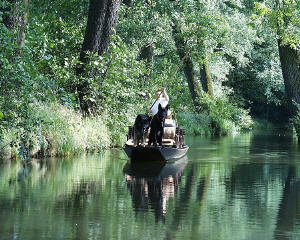 Many of them are descendants of the first settlers in the Spreewald region, the Slavic tribes of the Sorbs/Wends. Until today, they have preserved their traditional language, customs and clothing.